Did you know that most of us are fueling one of the world’s biggest ecological disasters and acts of primate genocide in history? Borneo and Sumatra are two of the most bio-diverse regions of the world, yet they have the longest list of endangered species. This list includes the magnificent orangutan. These two South-East Asian islands are extremely rich in life, containing around 20,000 flowering plant species, 3,000 tree species, 300,000 animal species and thousands more being discovered each year. Despite this amazing biodiversity and delicate web of species, an area the size of 300 football fields of rain forest is cleared each hour in Indonesia and Malaysia to make way for the production of one vegetable oil. That’s 6 football fields destroyed each minute. This vegetable oil is called palm oil, and is found in hundreds of the everyday products, from baked goods and confectionery, to cosmetics and cleaning agents… many of which you buy in your weekly shopping. Orangutans are some of our closest relatives, sharing approximately 97% of their DNA with humans. Orangutan means ‘Person of the jungle’ in the Indonesian language. It is estimated that 6 to 12 of these ‘jungle people’ are killed each day for palm oil. These gentle creatures are either killed in the deforestation process, when they wonder into a palm oil plantation looking for food, or in the illegal pet trade after they’ve been captured and kept as pets in extremely poor conditions and provided with extremely poor nutrition. 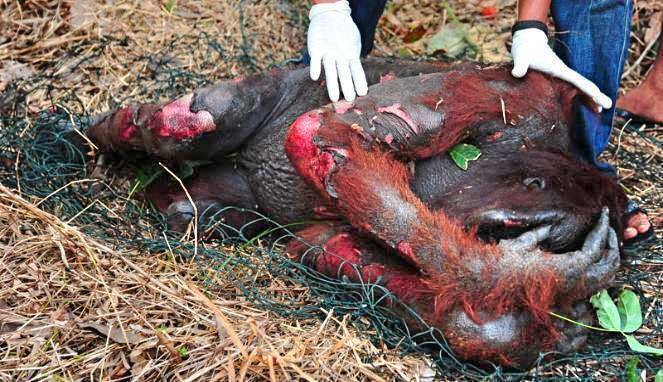 Palm oil is also having a shocking impact on our planet. The production of this one vegetable oil is not only responsible for polluting rivers and causing land erosion, but when the plantation workers set fire to the remaining trees, shrubs and debris to make way for the oil palms, it produces immense amount of smoke pollution that is toxic to planet earth. This has been found to be the second biggest contributor to greenhouse gas in the world.